At Budget Electric in Dubuque, Iowa, we understand the value you place in your business. After all, we have been in business ourselves for over 30 years. That’s why we work hard to ensure that your commercial interests are protected. We are master electricians, licensed and insured to provide commercial and industrial businesses with electrical solutions as well as repair services and upgrades. We work with big, small and medium-sized business and can devise a plan that is affordable and stays within your budget. We serve the Dubuque, IA area as well as Galena, Illinois. Budget Electric will service any type of commercial business including, but not limited to, educational facilities and student housing, fitness and health care centers, retail and wholesale facilities, government buildings, farms and factories. You want to make sure your business is up and running at its peak potential and so do we. We provide a number of services including maintenance of electrical systems and replacement or faulty, worn or outdated parts and components. We can wire build-outs and new construction for offices, churches, salons and day care centers. We provide next day service and free consultations and estimates. Distribution centers, chemical plants, grain facilities, airports, banks and real estate offices, we are master electricians who can help troubleshoot your electrical problems and devise solutions. We would be happy to discuss your plans to install or upgrade fire protection and telecommunications systems or power generators. We service commercial kitchens in need of repairs to appliances, breakers and fuses, circuits and fans. We can service car dealerships and other showrooms in need of exterior and interior lighting and pool lighting for hotels, motels and fitness centers. We install landscape lighting, track lighting, security lighting, inside or outside, as well as lighting for parking lots, supermarket, restaurants or other retail establishments. The experienced electricians at Budget Electric can get your business ready for electrical system and fire inspections and make sure your building has the proper surge and fire protection. We are electricians located in Dubuque, Iowa with over thirty years experience providing quality commercial wiring services to businesses throughout eastern Iowa and northwest Illinois. We let you focus on your business while we make sure your industrial or commercial wiring is up to date and up to code. Your business is a valuable investment and you should make sure your work environment is safe for your employees and your property is protected. Budget Electric offers flexible hours including emergency service. We provide free consultations and estimates for commercial wiring in Dubuque, IA and the surrounding area. If you need new wiring for your warehouse, office building or other commercial enterprise, call us today. For all your commercial and industrial electrical needs, choose the licensed and insured electricians at Budget Electric. 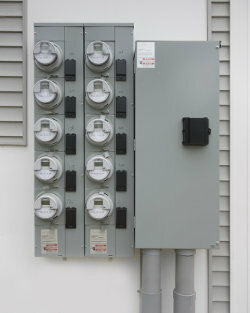 As master electricians, we have serviced the area around Dubuque, IA for over three decades. Call 563-590-5679 for all your needs in installation and electrical repairs. No job is too big or too small. We accept credit cards, personal checks and cash. Call today.